I could probably count on one hand how many times I said no to her. This night was not one of them. I put on my freshly shined shoes, she put on a killer black dress and we toddled off for a night out. 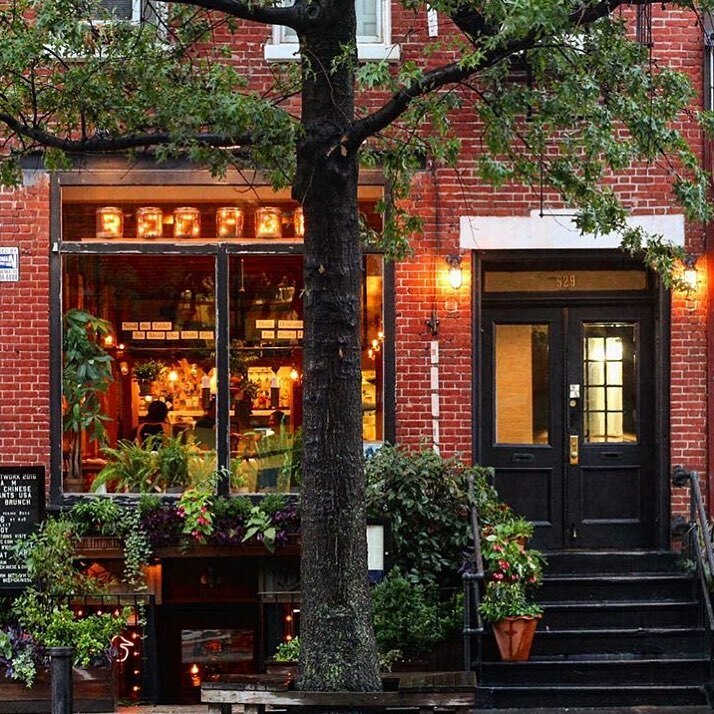 We ended up at RedFarm in the West Village, a restaurant that take classic Chinese dim-sum cuisine and truly elevates it. They take no reservations for small parties, instead placing customers on a large communal table in the middle of the restaurant where depending on your party size, they sit you across from one another. All garnished with a small bar tucked away in the back. We ensconced ourselves at the bar, perching on half-backed tiny stools that require you lean close to your dining companion so that you can appropriately ‘ooh’ and ‘aah’ over the cocktail list, the regular menu, and the daily specials. She selected the House Mule for a drink and I chose a super-tasty Gamay, because if I can’t have red wine, why bother at all? I’m sure you’re thinking that dumplings don’t seem to be a lot of food and that is where you would be wrong. Remember what I said at the beginning? The first thing they brought out were the Oxtail Dumplings, deep fried, meaty, salty, and delicious. They served it with a thick, spicy dipping sauce which was the perfect contrast to the salt and the soft crisp of the dumpling skin. 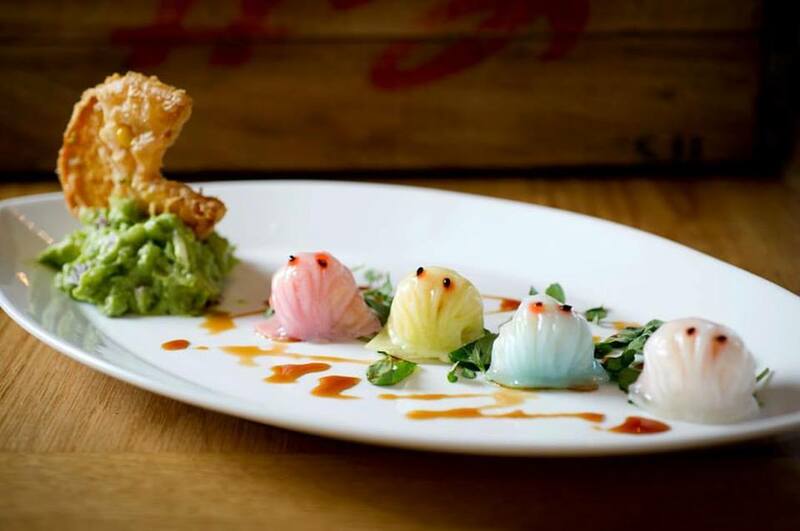 As we nibbled through this first set of dumplings the next set arrived, a delightful tempura-fried sweet potato shaped ‘Pac Man’ about to eat the little ghosts that normally chased him through the maze! The ‘Pac Man’ Shrimp Dumplings came with a mini-mountain of guacamole and my friend was pleasantly surprised how well guac worked with dumplings. Even as we were just getting through the first dumpling, a bamboo steamer with the Pork & Crab Soup Dumplings were delivered to us with this gentle warning, that it was best to leave this until later because the soup inside the dumplings would be quite warm. 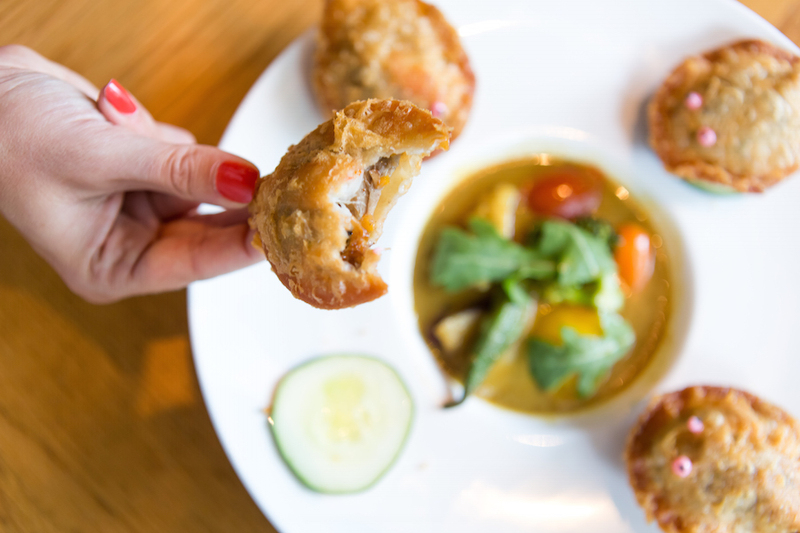 Right as that warning finished, out came the Crispy Duck & Crab Dumplings, another set of four, hearty deep-fried hunks of crispy deliciousness, complemented by a serving of a pitch-perfect Thai curry. Now, I’ve taken cooking classes and worked with curries from around the world: getting a Thai curry right, in texture, scent, and flavor, is an art form. The Crispy Duck & Crab was the heaviest thing we ate that night. They used fresh crab and fried-in the actual crab claw, so you had to twist it out by hand before you could bite into the dumpling. These were not dumplings for the light or picky eater. It was a full meal in every bite, especially if you dipped into the curry. My favorite thing about it was that by eating the cucumber that sat underneath the dumpling, the combination resulted in a taste curiously similar to banh mi, the amazing, must be eaten whenever the opportunity presents itself, French-influenced Vietnamese sandwich. 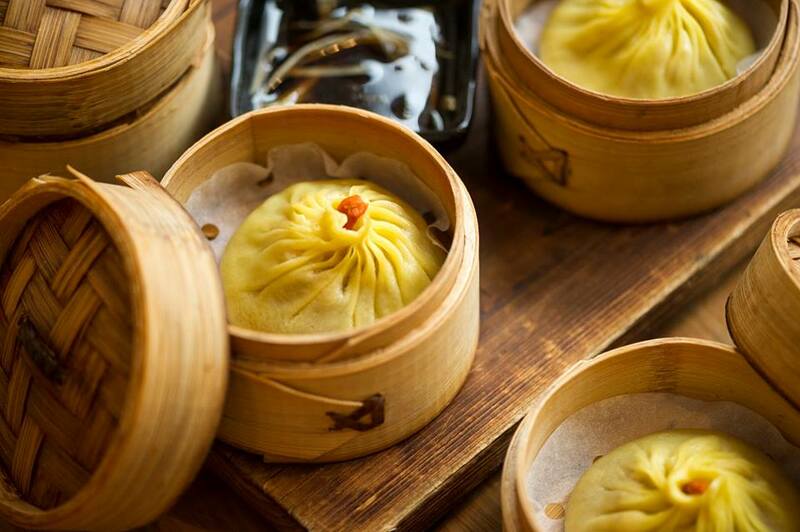 But I am getting off topic, let’s move on to the soup dumplings. All the rage from here to Shanghai we saved them until last in effort to see how RedFarm would treat this classic. Unfortunately, we might have waited a bit too long, for they had cooled to room temperature, which made the dumpling skins a bit too sticky. However, the soup remained flavorful, a gentle touch of salt and sweet on the tongue, and then the pungency of the black vinegar dipping sauce created a spot-on combination. After our feast of dumplings, we were full and satisfied. The House Mule proved to be the perfect palate cleanser because of the use of fresh ginger with sparkling water instead of ginger beer. All the while my wineglass was never left empty. The check at the end of the evening was not light, but every penny was earned. Three cheers for an excellent date night and four stars for an excellent restaurant. We came hungry; we left happy. Cassandra John has also written about reunifications in DC and recovery from hot tea and heartbreak in Dublin.